It's something that all of us dread. We're merging lanes, or braking at traffic lights, then smash! Even small car accidents can be somewhat traumatic. The key is to take a deep breath and follow these simple steps. Depending on the severity of the crash, the people involved might have injuries. It's important to thoroughly check yourself and your passengers for any head or spinal trauma. Whiplash is one of the more common injuries to occur from small accidents, and can lead to long lasting problems later. Even if you feel fine, if you feel you have hit your head hard you might have a concussion and need to go to hospital. If everyone in all cars involved is not in dire medical need, make sure you get the vehicles to a safe location, usually on the side of the road. You will need to call the police if anyone is injured or killed or the car needs to be towed away. When the police arrive they should assist you in making the crash as secure as possible, and advice you if you need to move your car out of the travel lane. Make sure you don't look like you're driving away from the crash when you do this, otherwise the other driver might get the wrong impression. Keep in mind that other drivers may hit and run, so keep in mind the license plate and make of the car in question. Either take a picture on your phone or say their number plate out loud, and repeat it until you have it memorised. Only leave your car if it is safe to do so. One of the only reasons to leave your car is if it is at risk of catching fire, which is unlikely in the event of a minor accident. Stepping out into traffic on a highway is never advised, so use the other door if possible. This is especially important if the crash occurred at night. Remember, you'd rather another car hit your car than hit you. When it is reasonably safe to do so, look for witnesses. Anyone that was within the vicinity of the crash, from pedestrians, to business owners, to other drivers, can potentially give their statement to the police. If they need to leave the scene, ask for their name and phone number. At this point you should exchange details with the other driver. Under Australian law, drivers involved in an accident must stop at the scene and give their driving details, not only to the other driver involved but to any pedestrians injured or owners of property damaged. This should include driver's license numbers, names and addresses. Also take note of the driver's insurance company and policy number, as you will need these details if you are making a claim. Finally, you should file a claim with your insurance company, or at least notify them of the crash. 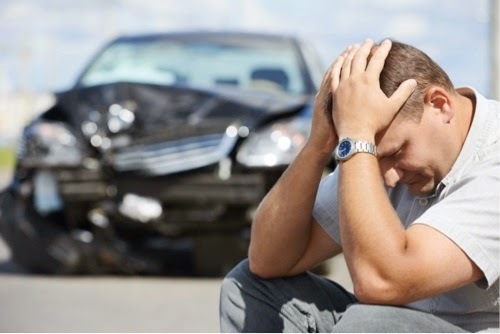 Notifying your insurance company without claiming can save you a lot if you plan to get a simple repair done yourself. Don't be swindled by your insurance company though! If you find you're being taken advantage of, seek representation. Click here to find out how you can get professional legal assistance.